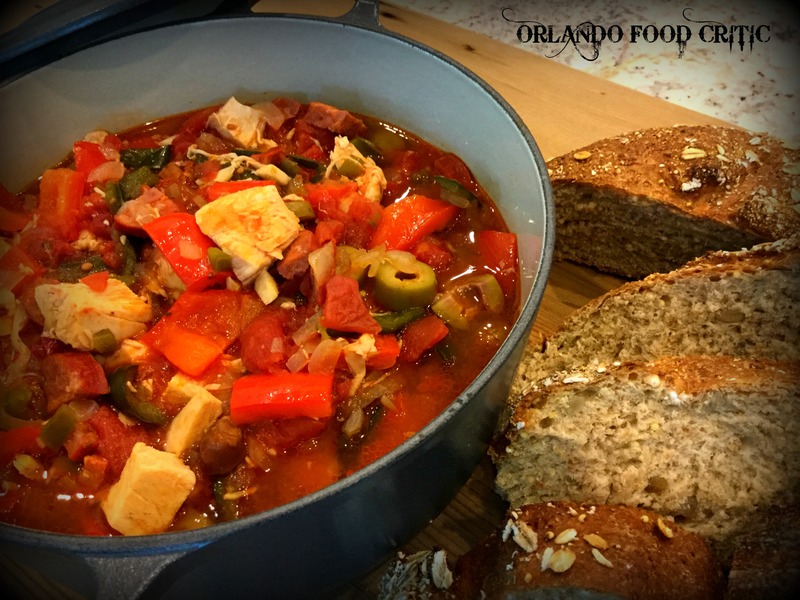 A great one pot meal that anyone can make and requires only a minimum of effort, but the taste is amazing. Serve in a bowl with warm crusty bread or over rice or noodles if you prefer. Of course, all the better if washed down with a chilled glass of Sauvignon Blanc or keep the Mediterranean theme going and try a glass of Pinot Grigio instead. This is a great dish for a casual lunch or a dinner party and always a crowd pleaser, it also makes an amazing center piece when I serve it my trusty Le Creuset Dutch Oven, they are a bit extravagant but last a lifetime and for sure give impact to any table. Please try the recipe below, whatever you serve it with, or in, I am sure you will become a fan. In a large Dutch oven style cooking pot gently fry the Chorizo sausage in 1 tablespoon of olive oil until browned. Add the onions and garlic and sauté until softened, then combine all the peppers (poblano, red pepper and jalapeno) and add to the pot. Continue cooking until all the peppers have softened about 4/5 mins. Pour over 1 cup of white wine, stir and simmer for 2/3 mins, then add the tomatoes along with ½ cup of water, allow to simmer for a further 5mins. Add the chicken, olives and red pepper flakes and season with salt and pepper, stir until all the ingredients are combined. Bring back to a simmer, cover the pot and allow to cook slowly on a low heat for about 1 hour, stirring occasionally. Prefect served immediately but the depth of flavor increases if chilled and served hot the next day.